One of the most important and used words when talking about computers and the internet these days, is “privacy”. Whether it’s talking about snooping by governments or organizations like the NSA, keeping your private information safe from hackers, protecting yourself while downloading P2P or hiding your tracks from software and while online, keeping as safe as possible is something which needs constant attention. There are many computer utilities around that aim to help you keep your computer safer by deleting old junk files, cleaning program activity and browsing history etc, Piriform’s CCleaner probably being the most popular and well known tool of this type. There are many free tools that handle most of the standard privacy cleaning tasks, and also a sizable amount of paid for offerings for more advanced functions. 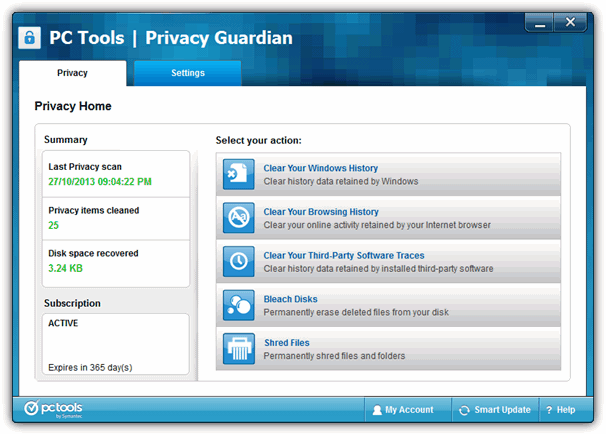 One such commercial application that costs $19.99 is Privacy Guardian by PC Tools. Although PC Tools was sold to Symantec a few years ago and their antivirus/firewall software discontinued, other tools such as Registry Mechanic and Privacy Guardian are still available for sale. In this article we’re going to tell you what it does and show you how to easily get PC Tools Privacy Guardian for free! The Privacy Guardian program has several cleaning modules that handle various tasks depending of which parts of Windows or browsers and programs you want to clean. Windows History will perform the standard Windows cleansing of areas all free or paid tools of this type would do, like; the Recycle bin, clipboard, temporary file folders, the Run dialog history, Checkdisk leftover files, document history and search history. There are a total of 7 Internet Browsers that have their own cleaning routine, Internet Explorer, Firefox, Safari, Google Chrome and Opera. The other 2 are Mozilla Browser and Netscape although you aren’t likely to need those. You can choose to remove the browser cache, history, address bar history, cookies passwords and various bits of form data. Specific cookies can be retained in a separate window. Privacy Guardian can also clean the history of around 120 third party programs via its plugins module, including chat clients, security software, image viewers, P2P tools and loads more. It will blank out those programs not installed and can update this list using the Smart Update button when new programs or updates become available from time to time. In addition to the file and folder cleaning features of Privacy Guardian which simply deletes the data, there’s also some secure cleaning functions that can be run on the hard drive as a whole or individual files and folders. The Bleach Disks module will completely wipe the free space on the selected drive so any previously deleted data becomes unrecoverable, current files are not touched. Shred Files allows you to drop files and folders onto the window which will then be securely deleted, there are 4 different shredding algorithms to choose from in Settings. 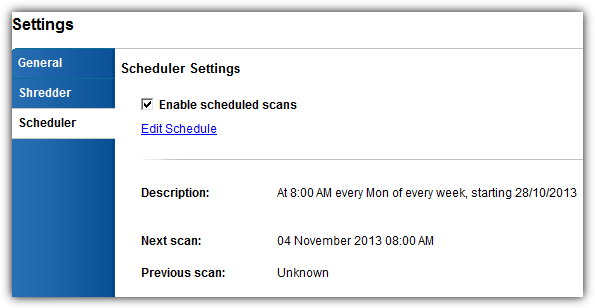 The last function to mention is quite important because it’s the scheduler which can configure the cleaning process to automatically run either on Windows startup, on a specific day of the week or at a set time every day. This way you don’t have to worry about forgetting to run a cleaning cycle yourself. 1. Go to the PC Tools Privacy Guardian Offer page. This page is an official giveaway webpage on the PC Tools website. 2. Enter your first name, last name, email and country, and then click the Submit button. Make sure that you’re entering an accessible or temporary email address because the license key code will be sent there. 3. Once you see the message “Your FREE Privacy Guardian license has been generated and emailed to the email address you provided”, check the email address that you’ve entered in step 2, the email should arrive within a minute or two. Open the email from do-not-reply@pctools.com with the subject “PC Tools Privacy Guardian License Information”. Note down the license name and license code. 4. 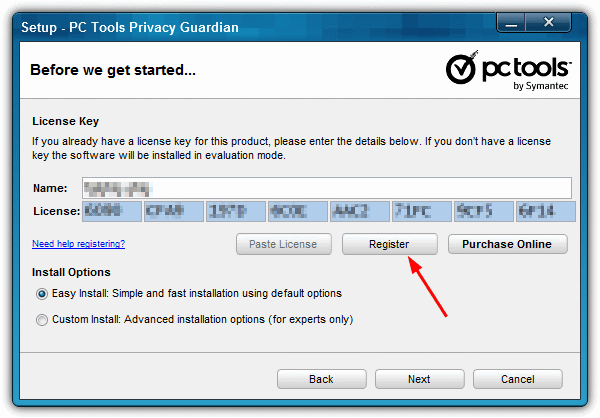 Download the latest PC Tools Privacy Guardian from the PC Tools website and install the program. The latest is currently 5.0.1. 5. During installation enter the license name and license key from the email. You can use Ctrl+V to paste in the name and the Paste License button for the serial key. Then press Register. 6. You should get a popup saying Privacy Guardian license appears to be valid, and then can continue installing. Once the program has loaded, you will have 365 days left on your license. It’s odd that this giveaway page has been active for so long for a commercial product, but it’s good for all those users who want to take advantage of it! As this is a cleaning program, you can use it in conjunction with CCleaner or other privacy cleaning tools as they don’t clash with each other. One tool might do something or clean a location another misses. Many thanks , Most useful. Thanks raymond; I used to use clean mantra but will prospect this option for some time. The only thing I couldn’t erase is the history of typing (such as searching for avast and…) in the google bar. Probably this one will do the job. Ray.. your knowledge has been very insightful and a savior at times when trying to figure stuff out..
much appreciated from the other side of the world.. I will have to give this program a miss because I just installed Spyware Doctor, although I’ll just get a key anyway. Good day to all. First off, I wish to thank raymond for the note on this program. secondly, I just wanted to inform anyone who installs and uses this product to PLEASE check your settings. I checked my settings and then did a scan of my drives. Whew, a lot of temporary files went bye bye. However, I did have a little problem. I use ZoneAlarm (why? – because I like it) and all of a sudden I found that it wasn’t working. The True Vector security service was shut down. I uninstalled ZA and reinstalled it with updates and with a bit of frigging around finally got it to work. CHECK your settings !!! Watch the “Third Party Setting” closely or you may get burnt. I’m going to contact Privacy Guardian help line to see if they can give me any advice. Who know, I may (probably) screwed up.